I'm a fan of Blanton's Single Barrel (46.5%abv) more so than I am of Blanton's Straight from the Barrel (60+%abv). Preferring a lower ABV version of a whisk(e)y is tantamount to heresy in many circles. Thankfully my circle is more forgiving. Jordan from Chemistry of the Cocktail critiqued the valorization of cask strength whiskies very well, almost three years ago. I'll add my thoughtful crappy take on this matter once I can figure out how to string together two paragraphs about it. But Blanton's more or less captures my viewpoint. The higher alcohol percentage provides nothing but ethyl heat, closing off much of the whiskey's richness and character. This isn't true of all bourbons. But it's been consistently true of Blanton's, so much so that I'm not that disappointed Straight from the Barrel isn't sold in The States. Goodness knows what retailers would be selling it for. Yes, I'm already giving you a hint about the results of this tasting, if you hadn't already scrolled down to see the rating. My first review of Straight from the Barrel (#68) was back in 2014, click here for that one. I also had pours from two different barrels while in Japan, with similar results: lots of cherry, much better with water. 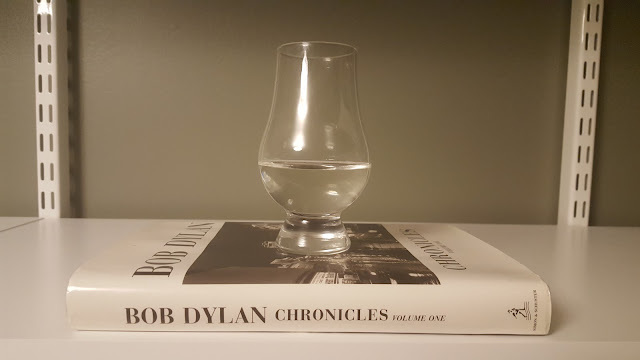 So here goes my fourth shot (if you will) from a sample purchased from whiskysite.nl last year. It has plenty of color to it, as opposed to the photo above. The nose is plenty hot, in fact it took almost 45 minutes of airing out before I could find these notes. At first it's corn syrup and flowers. From underneath that arrives a cinnamon and cherry syrup. Cherry & lime lollipops. Melting cherry popsicles. You the get the point: cherry candy. A little bit of caramel, vanilla, and grapefruit. Ethyl sits up front in the palate and refuses to move. Way behind that is cherry candy, cayenne pepper, molasses, salt, oak pulp, and a burnt note (though that might just be my tastebuds getting cooked). There's a palatable bitterness in there somewhere. The vague hot finish leaves a long burn and not much else. Sweet cherry-flavored meds and chili oil. The nose becomes clearer. Cinnamon, vanilla, dried apricots, and fresh plums. Some Sazerac Rye, sawdust, and caramel. The palate is quite candied, but that gets balanced out a bit by the good bitterness. Caramel, bubblegum, mint, ginger, and rye. Feels a bit thin in the mouth, though. Corn and cherry sweetness make up most of the finish, though it's less cloying than when neat. Maybe some hints of bubblegum, fresh ginger, and chili oil. As referenced in the notes, the whisky took 45 minutes of air before it opened up a little. Previous to that it held but two dimensions: cherry candy and face burning. The neat nose isn't terrible, once one can find it. The palate is fine, once one's tongue regains feeling, but the finish proves to be bland. Dilution provides added dimension to all the pieces, turning it into kind of a sugary version of the regular Single Barrel. But it also feels watered down in the mouth and doesn't finish strong. There's nothing here (at 64.9% or 46.5%) that can't be regularly beat by the Single Barrel. Straight from the Barrel is a decent bourbon (one diluted) but I'm in no mood to try it a fifth time. I quite like Blanton's STFB and rate it my top regularly available barrel-proof bourbon, but my experience is quite limited. I recently tried Stagg Jr (2015 release, I think) and found it to be quite similar, cherries and barbecue sauce, but nosed a little more enjoyably. I suppose with Stagg Jr being available in the States (only recently here in Japan), and it being so similar to STFB, there's really no need to have another barrel-proof $60 Buffalo Trace bourbon on the market there, and given the traction Stagg Jr. already has there, it seems prudent to keep STFB as an overseas exclusive.